After first being officially announced on December 21 at the 2003 Jump Festa event in Japan, Final Fantasy Crystal Chronicles marked the dawn of a new era for Nintendo fans. After Square Enix packed their bags and left Nintendo’s consoles, the state of the role-playing genre on Nintendo’s consoles was questionable; developer after developer tried to create something that could shift hardware but nothing seemed to work. Naturally, when gaming giant Square Enix announced that they had plans to release a new Final Fantasy title on the Gamecube, gamers rejoiced. At the same time though, many were still scratching their heads in confusion. 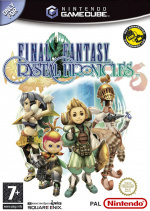 Crystal Chronicles was developed to be more easily accessible than other Final Fantasy titles due to its action-oriented gameplay and user-friendly interface. What had made Square Enix depart from the standard turn-based Final Fantasy gameplay mechanics and try out this new type of gameplay? When gamers finally got their hands on the final product though, they knew why; Square Enix wanted to take a new approach on the series, and it worked. 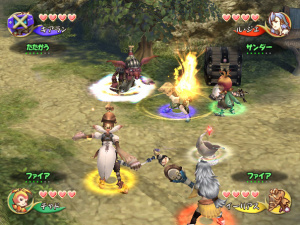 Final Fantasy Crystal Chronicles starts the franchise on a new page by throwing players into a world full of danger. A strange toxin called Miasma is polluting the planet and wiping out all living things along the way. The only way to stop this strange epidemic is to counter it with certain crystals, but these crystals fail if they are not replenished each year by a substance called Myrrh. Each town must send a young adventurer out each year to obtain Myrrh, and believe it or not, that young adventurer just so happens to be you. Unlike more traditional Final Fantasy titles, Final Fantasy Crystal Chronicles puts very little emphasis on building the story. Right from the start, the game throws players into a pitch-dark cave, shedding only tiny portions of light on the game’s story. As the player progresses through the game, things start to become clearer. That said, what little story the game possesses proves to be decent. Your life as an adventurer spans over five years of fighting through dungeons, defeating bosses, and collecting precious drops of Myrrh. Whenever you embark on a quest, your caravan appears on the world map. Using the map, you’ll make decisions as to whether or not to enter a dungeon, visit a village and so on. While the game may give you option as to what to do, it's fairly linear, with the dungeons you have to play in a fixed order. Though there’s occasionally a choice as to which one you want to do first, the result of completing both will be the same. 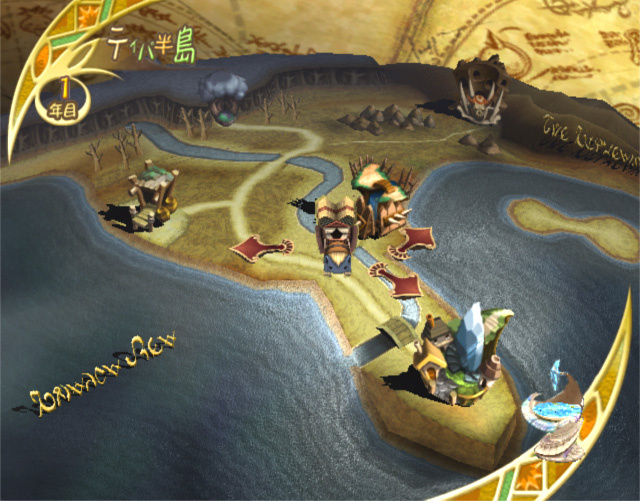 The world is divided into five sections by Miasma streams, which can only be passed by defeating a specific boss, making the game feel even more linear. For the most part, the action-based gameplay works brilliantly. Players will find themselves fighting through fourteen action-packed dungeons over the course of the game, all with their own distinguishing features; some can even take upwards of an hour to complete. With that being said, it isn’t difficult to get lost, and in this type of game, that’s something we hadn't quite bargained for. Inside dungeons though is where the biggest gameplay changes can be viewed. For starters, one of the characters in your party has to carry a crystal chalice that’ll keep your party alive as long as they stay within a certain radius. In multiplayer modes, this can prove to be an irritating task seeing as whoever has the chalice slows down and can’t fight or pick up items unless they drop it, which prevents the rest of the party from moving. While playing solo, a moogle can carry it, allowing you to experiment with your surroundings a little more. For such a multiplayer-focused game, it's a shame to say it's one aspect of the game that could use a little more polish. Right from the start, players will have to try and get everything set up by gathering four Game Boy Advances and four Game Boy Advance link cables. It’s a tedious task that gamers shouldn’t have to go through just to play a quick game with friends. Besides that minor inconvenience, the mode runs smoothly and is just as fun as the single player outing. Once you've got your buddies together you'll find the combat is fairly straightforward. By using your acquired magical spells and weaponry, the game puts you face to face in battles with hordes of monsters. 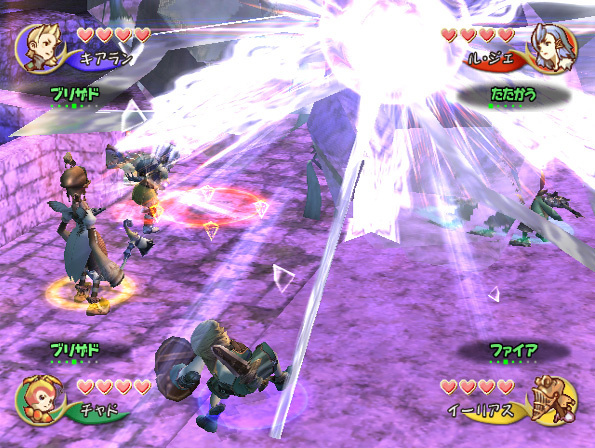 The controls work great when fighting, and spells and attacks only take a second or two to execute. In boss battles though, battles can be much more fierce. 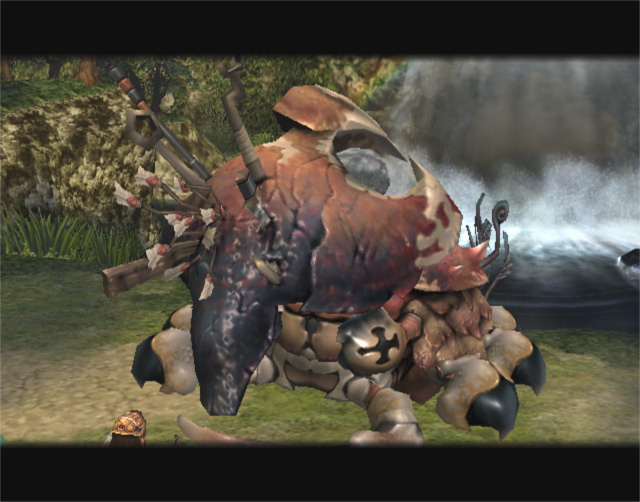 As you’ll quickly discover in these fights, bosses pack a real punch and have a unique technique, and exploiting their weaknesses is the key to victory. 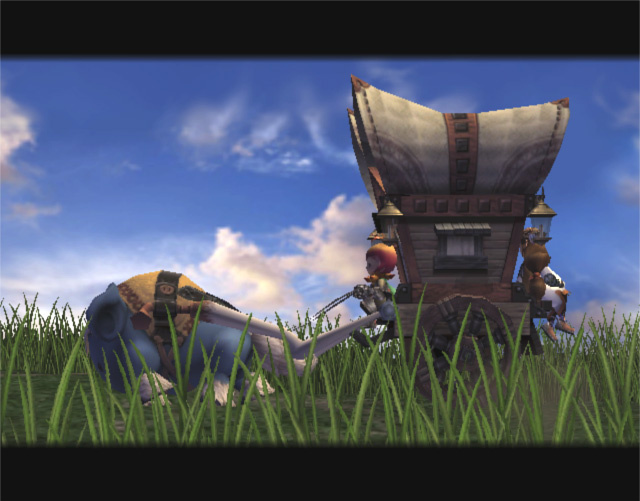 From a visual perspective, Final Fantasy Crystal Chronicles is absolutely breathtaking. The amount of detail and quality work put into each environment is absolutely top-notch, as is the beautiful music. It isn’t uncommon to find yourself stopping in the middle of a battle just to take in the scenery or music - yes, it’s that good. 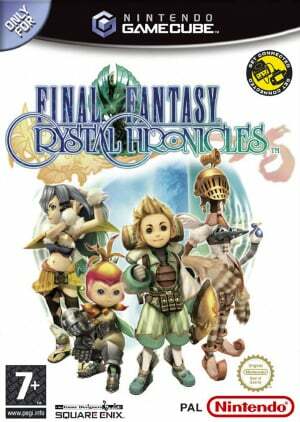 Though some may be annoyed by the radical departure Final Fantasy Crystal Chronicles took from the main series, the end result is fabulous. Though some of the minor decisions the developers made when developing the game are questionable, the core gameplay itself is fabulous and really helps it stand out from the pack.. The gameplay is just as addictive as past titles and the difficult curve is spot-on. While all these amazing things came at the cost of the story, it still proves to be somewhat decent. Simply put, Final Fantasy Crystal Chronicles is a spectacular title that'll surely please any newcomers to the franchise. Between this, Four Swords Adventure, and yes, even Pac-Man Versus, GBA cable games really did rock my socks. It's a shame how difficult and expensive it was to acquire everything needed though. Ideas like this really need to be revisited with the Wii and DS. GBA cable nights were always the best (though Four Swords and Pac-Man were a lot more fun than this, I found). I only thought this game was okay even though I really liked the opening (song). However, I really really look forward to Crystal Bearers, whenever the blue blazes that decides to be released! I'm a big fan of GBA-GC connectivity, even given the extra complication of getting all the right equipment (however I keep several old GBAs and cables around, bought in bulk from a Goodwill, for exactly this purpose). I agree with Adam that the other two big connected titles (Zelda, Pac Man) were more enjoyable than this one, but I'm not sure I've given this one a fair chance yet. Every time I managed to get 3 or 4 people together willing to give one of these games a shot, I'd put in Zelda, since that's one of my favorite multiplayer games of all time, but that means that I neglected FF:CC. I would love to see a sequel to 4 Swords, with Wii-DS connections. While FF:CC seems to have jumped in first with their new Wii/DS game, it doesn't look like it really takes proper advantage of the difference between the systems. 4 Swords was spectacular in its clever usage of the big shared screen on the GC and the smaller, private GBA screens, allowing a combination of public and private events and areas in one experience. We need that on the Wii and DS. I found this only fun with friends, and a repetitive solo experience. 7/10 for me (I went Corbie on you all ). Perhaps since DS has two screens there just isn't a need for the TV screen used via Wii. You can have your private screen at bottom and public screen at top. For some reason though, I still crave that connectivity and that public, shared screen in contrast with the private screens. Maybe that is irrational, but it just worked so well that I find it hard not to want more. I hate turn-based final fantasy crap!!! But... I played this beauty to death with two GBASP's and i loved every second of it! My Life as a King and the many epic and amusing vids of the new one (not echoes) have got me hyped! This is so far the only Final Fantasy game I've ever played, and I have to say, I really enjoyed it in multiplayer. At first it seemed pretty boring as one of you has to carry the chalice, but once I got into the spirit of teamwork I really enjoyed it. I'd like to give the DS one a go, as it's still a pretty untapped market on consoles. I have played threw every Final Fantasy game but this one I just could not bare to play for to long. The idea of multiplayer was a VERY good idea, the fact that having to carry around the bloody chalice was horrible. Toss in that you HAD to have a GBA in order to gain the benifit of multiplayer was another bad mistake on Squares part. It had the potental to be an amazing game, but it fell VERY short of the mark. I dont caer that i cant play a 4 player of this its just awsome playing by yourself. Cool, they have this game for 9 dollars at my local Gamestop! WOPW!! a Positive Review on FFCC!!! now ill Buy FFCC For sure.